Skilfully designed to catch salmon, fishing flies and lures hooked enthusiasts at Shropshire sporting specialist Mullock’s (20% buyer’s premium) fishing sale which included the work of two great names in the angling lexicon. One was the splendidly named Onesimus Ustonson (1736-83), whose shop off Fleet Street remained a family concern from 1761-1855, having supplied tackle to, among others, the naturalist Joseph Banks, George IV, William IV and Queen Victoria. He is best known for inventing the multiplying reel but was represented at the Ludlow sale on February 2 by the salmon lure Pearl Minnow, shown above, attributed to him. 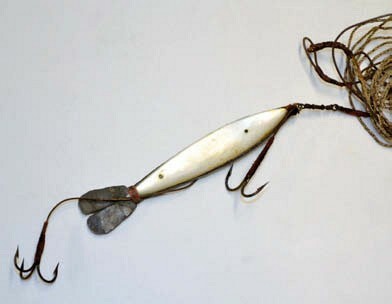 The multi-hooked 3in (7.5cm) long mother-of-pearl and pewter lure was produced from c.1770-1855. While extremely difficult to date, this was thought to be an earlier example than similarly attributed Pearl Minnows which have made £7000 and £6200 at Mullock’s in the last couple of years. Estimated at £4000-6000, the latest lure sold for £7000 hammer at Church Stretton. The second great name was Megan Boyd (1915-2001), whose hand-tied fishing flies were posted to adoring clients from her cottage in Sutherland. “Probably the largest single, cohesive collection of Megan Boyd flies in existence,” noted auctioneer John Mullock of the 47 unused, untarnished and unfaded flies which were created for the vendor, a friend and neighbour in the 1970s. Still in their original wrappers – and the 1978 re-used envelope in which they had been mailed – these included famous designs such as Durham Ranger, Stoat’s Tail and Jock Scott plus a prized Megan Boyd, a fly she created only for special clients. Estimated at £10,000-20,000, the collection (also shown above) sold to a private bidder at £22,000. Despite her legendary knowledge of the Highland rivers and how to fish them, Boyd never fished herself.